Hollywood virtually perfected the war movie in the 1920s and 1930s, beginning with such movies as THE BIG PARADE and WINGS in the 1920s, followed by movies like ALL QUIET ON THE WESTERN FRONT, THE LOST PATROL, A FAREWELL TO ARMS, and GUNGA DIN in the 1930s. Of course, the World War II era in the 1940s stands out, beginning with Gary Cooper’s SERGEANT YORK in 1941. Certainly, many Hollywood war movies featuring epic and more intimate battle scenes focus on many other things besides men in battle. For example, SERGEANT YORK is about two-thirds done when it finally gets to its exciting battle scenes. Such is also the case with Mel Gibson’s new masterpiece, HACKSAW RIDGE, which has a similar theme in that it involves a Christian conscientious objector who finds a way to support his country honorably, without abandoning his faith and convictions. In the older movie, the hero finds a way to get scores of enemy troops to surrender peacefully. In the new movie, the hero finds a way to serve his country and save lives. The classic Hollywood war movie often entails a disparate group of men (sometimes both men and women in more contemporary movies), who must fulfill a particular mission or series of missions (BATTLEGROUND or THE DIRTY DOZEN). Sometimes, they even go through a whole war together, as in World War II veteran Samuel Fuller’s THE BIG RED ONE. The different individuals in the group must learn to work together, often under the command of a single charismatic individual, but sometimes under one commander and one platoon leader, often a sergeant. Conflict can occur because of the different attitudes and different ethnic cultures within the group, or because the commanding officer and officer of lower rank disagree about strategy or military tactics. Sometimes, the attitude of a “lone wolf” in the group can endanger the cohesion of the group, as in Don Siegel’s HELL IS FOR HEROES starring Steve McQueen and Bobby Darin, where the stunning sacrifice of Steve McQueen’s character brings Bobby Darin’s cynical atheist character to Christian faith at the last minute. In addition, there are some war movies where a veteran soldier melds a band of young recruits into a single cohesive group, as in THE BIG RED ONE or THE SANDS OF IWO JIMA with John Wayne. Whatever the case, however, the brotherhood of the group often is ultimately challenged by the physical, military obstacles confronting the soldiers. Obviously, levels of patriotism will vary in each war movie, but they often will become an important theme within the story despite the efforts of the moviemakers to devalue them. Finally, the power of war to either brutalize or desensitize the moral conscience and psychological temperament of the soldiers, or an individual soldier, can also be an important theme within the Hollywood war movie. This is one thing that happens in the acclaimed Oscar-winning movie THE HURT LOCKER. Sometimes, war even causes insanity, as in APOCALYPSE NOW, the Civil War sequence in THE GOOD, THE BAD AND THE UGLY, or Stanley Kubrick’s FULL METAL JACKET. How the individual characters deal with the brutality of war is the key element. Religious faith and human fellowship, however, can play a role in moderating the dehumanization that occurs, as in HACKSAW RIDGE. 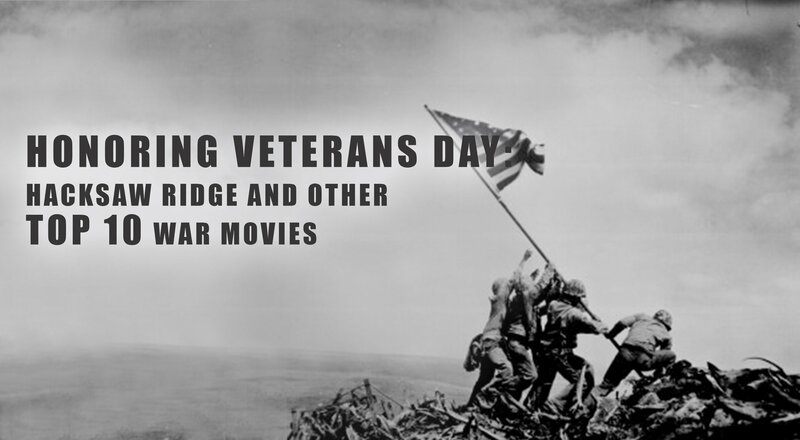 In that spirit, here is a list of some of our favorite war movies, with a list of several of the best movies about veterans on the home front. 1. SERGEANT YORK: Quality: * * * * Acceptability: +4 – 1941: Based on the diary of Alvin York, the most decorated soldier in World War I, this moving story tells about a willful man, played by Oscar winner Gary Cooper, who comes to Jesus Christ and comes to terms with war. After his conversion, Alvin is deeply troubled about fighting in the war because he cannot reconcile the Bible’s teaching against killing with participating in a war to defend his country. Before making his final decision about filing for conscientious objector status, Alvin spends time reading the Bible and being alone with God on the mountain. There it becomes clear what God wants him to do. Sensitively directed by the quintessential masculine director, Howard Hawks, SERGEANT YORK is a great American movie; it’s also a great Christian movie. 2. BATTLEGROUND: Quality: * * * * Acceptability: +3 – 1950: BATTLEGROUND is one of the best war of all movies but it’s also one of the movies that best epitomize the genre. It focuses on a disparate group of American soldiers in one platoon during the Battle of the Bulge. They endure cold weather and lack of good food and shelter as well as the firepower of Nazi Germany in one of the hardest but also most triumphant battles of World Wart II, or any other battle in American history. The movie focuses on the psychology and morale of the soldiers in the platoon, who are trapped by the Germans near Bastogne. They are led by James Whitmore as a tough but kind-hearted sergeant, with Van Johnson, Ricardo Montalban, George Murphy, and John Hodiak as the soldiers faced with a fight for survival and sanity. Toward the end, a chaplain delivers one of the greatest, most inspiring war-time sermons in movie history. 3. HACKSAW RIDGE: (Extreme Caution) Quality: * * * * Acceptability: -2 – 2016: Desmond Doss, a conscientious objector who received the Medal of Honor for his bravery in the Battle of Okinawa in World War II. Desmond grew up in a violent home and promised God he would never touch a weapon. Desmond enlists as a conscientious objector and enters one of the most brutal battles in the war. He pulls off a rescue of 74 soldiers that’s miraculous and attests to the importance of prayer, faith and convictions. HACKSAW RIDGE demonstrates the brilliance of acclaimed filmmaker Mel Gibson. The entire movie is a call to faith in Jesus Christ! As such, it’s a terrific, powerful drama about the trials and triumphs of the human spirit during war, a tribute to the sacrifices and courage of American soldiers during World War II, and a great story about the faith and courage of one American hero. HACKSAW RIDGE is about standing firm when others attempt to force you to compromise. The war violence is gruesome, bloody and very difficult to watch. Thankfully, all “f” words and offensive profanities are edited out, but the movie is peppered with many other obscenities. MOVIEGUIDE® advises extreme caution for these elements. Otherwise, HACKSAW RIDGE is a captivating, important movie about uncompromising faith and miraculous courage that will make you laugh and cry. 4. THEY WERE EXPENDABLE: Quality: * * * * Acceptability: +3 – 1944: THEY WERE EXPENDABLE is John Ford’s stirring and patriotic, but thoughtful, tribute to the men who proved the need for PT boats in the Pacific Theater during World War II. Robert Montgomery plays their leader, Brick, and John Wayne plays Brick’s right-hand man, Rusty. THEY WERE EXPENDABLE is brilliantly made. It features an early role by Donna Reed as a nurse who falls in love with John Wayne’s lieutenant, only to be parted from him when the Japanese invade the Philippines. A funeral scene where Wayne gives a moving eulogy to two fallen comrades in arms is very poignant and patriotic. The ending delivers another sober, poignant message about the different kinds of sacrifice that occur in wartime. 5. WE WERE SOLDIERS: (Extreme Caution) Quality: * * * * Acceptability: -2 – 2002: WE WERE SOLDIERS is a true story starring Mel Gibson as Col. Hal Moore, who led the first American helicopter troops into battle against the Communist North Vietnamese in 1965. Despite some minor flaws and very strong, bloody combat scenes laced with some strong profanities, WE WERE SOLDIERS delivers a riveting drama with strong appeals to God in the Name of the Holy Christian Trinity. 6. THE PATRIOT: (Extreme Caution) Quality: * * * * Acceptability: -2 – 2000: THE PATRIOT stars Mel Gibson as a family man named Benjamin Mark, who wrestles with his desire for revenge and the just cause of the American War for Independence in the late 1700s. The cruel British Colonel Tavington, played impeccably by Jason Isaacs, shoots Ben’s 15-year-old son, Thomas, as Ben’s oldest son, Gabriel, is led away captive. Thus, Ben’s fury is unleashed, and taking his two youngest boys, he goes into the woods to fight a guerilla war, slaughtering the British and rescuing Gabriel. Ben continues to wrestle with his sinful desire for vengeance and the worthiness of the Revolutionary cause. Eventually, he sees that he needs to stay the course, and he rejects vengeance to take up the flag. The violent battle scenes may concern older moviegoers, while younger moviegoers might chafe at the soul-searching, but the heart of this movie is faith. Prayer runs throughout the film, and the Cross of Jesus Christ is lifted up. THE PATRIOT is also a terrific, engrossing movie. One can only hope that this soul searching and pain will lead many to search for the God to whom Ben prays so often in this story. 7. GETTYSBURG: Quality: * * * * Acceptability: -1 – 1993: Ron Maxwell’s epic film GETTYSBURG, based on Michael Shaara’s Pulitzer Prize-winning novel THE KILLER ANGELS, dramatically depicts the three most courageous days in American history when North and South were arrayed against each other in the decisive battle fought on the Gettysburg, Pennsylvania plains. The scenes re-enacting Pickett’s charge are believed to be the largest period scale sequences filmed in North America since D.W. Griffith’s BIRTH OF A NATION. The movie overflows with positive references to God and prayer. Aside from some of the curses used by the soldiers, GETTYSBURG is a magnificent movie that every American should see. 9. UNBROKEN: Quality: * * * * Acceptability: -1 2014: UNBROKEN is an immensely powerful biographical movie about the life of Louis Zamperini, who became a famous evangelist. The son of Italian immigrants, Louie goes from being a mischievous young boy to an Olympic runner at the 1936 Berlin Olympics. When World War II begins, Louie joins the Air Force, but a tragic malfunction causes his plane to crash one day. Only Louie and two men survive. Stranded for weeks on a raft, Louie and the other men strive to survive, but bad goes to worse when they’re taken by the Japanese army as prisoners of war. Through extreme hardships, Louie refuses to give up. UNBROKEN is a worthy, well-directed adaptation of the riveting biography by Laura Hillenbrand, but it doesn’t cover Louie’s actual Christian conversion after the war. It’s still an inspiring story about fighting for liberty amid injustice, retaining one’s values despite intense persecution, persevering when all is lost, and holding onto hope when all hope seems gone. The movie extols Christian prayer and loving your enemy. UNBROKEN warrants extreme caution due to some intense violence and foul language. 10. ACT OF VALOR: (Extreme Caution) Quality: * * * * Acceptability: -2 – 2012: ACT OF VALOR is a riveting, explosive war movie. Real Navy Seals play the key roles. Two Seal Team 7 leaders send their team to Latin America. The mission is to rescue a female CIA agent captured by a drug lord, in cahoots with a Muslim terrorist. The agent has information confirming the link. An intense firefight occurs at the drug lord’s secret jungle compound. The team barely gets away, though one soldiers loses an eye. The drug lord is connected to a Russian arms dealer. The dealer is childhood friends with the terrorist planning the attack on America. Can the Seals get to the terrorist and his gang before they enter the U.S.? ACT OF VALOR sizzles with action. The action scenes are among the best, most realistic ones ever filmed. The movie isn’t all about the action, however. It’s also a heartfelt, patriotic parable about the emotional toll defending one’s country can take on soldiers and their families. That said, the war violence is very strong, with bloody scenes and pointblank shootings. There’s also plenty of strong foul language. ACT OF VALOR is designed for mature adults. Other great, relatively family-friendly war movies that focus on the soldiers who fight in wars: THE PURPLE HEART, AIR FORCE, WINGS, THE BIG PARADE, TORA! TORA! TORA!, WHERE EAGLES DARE, THE GUNS OF NAVARONE, KELLEY’S HEROES, THE GREAT ESCAPE, HELL IS FOR HEROES, THE BRIDGE ON THE RIVER KWAI, THE BRIDGES AT TOKO-RI, STALAG 17, PATHS OF GLORY, ACTION IN THE NORTH ATLANTIC, U-571, THE LOST PATROL, GUNGA DIN, GODS AND GENERALS, GLORY. 1. THE BEST YEARS OF OUR LIVES: Quality: * * * * Acceptability: +1 – 1947: THE BEST YEARS OF OUR LIVES opens with Fred, Homer, and Al catching a ride on a B-17 back to Boone City. Fred, a bombardier, has nightmares about friends going down in flames. Homer lost his hands, but has become adept at using hooks. Al returns from the Army to a promotion at the local bank and two grown-up children. The night he returns home, he takes his reserved wife and daughter “on the town” and gets stumbling drunk. When Fred has difficulty finding a good job, his spendthrift wife seeks a divorce. Homer rejects his family and his fiancée because he wants to be treated as a normal man. Al struggles at the bank with being too generous making loans to veterans. THE BEST YEARS OF OUR LIVES does a remarkable job capturing the issues confronting returning American servicemen after World War II. It’s a true masterpiece that’s compassionate, profound, and uplifting, with several amazing performances. THE BEST YEARS OF OUR LIVES is also very patriotic, with strong Christian elements in a wedding scene, but there is some smoking and alcohol abuse. The movie is almost a perfect salute the America’s World War II veterans. 2. FORREST GUMP: Quality: * * * * Acceptability: -1 – 1994: FORREST GUMP is a delightful adult fairy tale spanning three decades of the last century in America, from the advent of Rock and Roll through the Vietnam War and the Hippie Craze into the 1970s and beyond. Forrest is a lovable, dim-witted hero in a picaresque tale of America during those times. From Elvis Presley to JFK to President Nixon, Forrest Gump meets them all, becomes a football star, war hero, athlete, and millionaire. In doing so, he gives us a comic and rueful overview of political and social events and persons that have entered into our national consciousness. Although Southerner Forrest Gump has an IQ of only 75, his optimism and generosity place him in extraordinary circumstances during extraordinary times. Viewers travel with Forrest on his comic ventures as he becomes an All-American, joins the Army and wins the Congressional Medal of Honor, goes on to own a conglomerate, becomes a celebrated runner, and wins his one true love. The highlight of the movie is Forrest’s relationship with two brothers in arms, one of whom dies and one of whom becomes a disabled veteran whop questions God but eventually comes to faith. FORREST GUMP is a delightful adult fairy tale in the tradition of BEING THERE, RAINMAN and the Orthodox Holy Fool stories. It is well-crafted in every facet, combining special effects technology and storytelling to give us an extremely entertaining film. Tom Hanks is uncannily ingenious as Forrest. Due to the decades explored, there are gross vulgarities and obscenities, implied fornication, as well as depicted drug abuse. However, all of it leads to the overwhelming conclusion that Americans who live a pure, hopeful life of faith will live better lives than those leading a wanton or bitter godless lifestyle. 3. NO GREATER LOVE (2017): (Extreme Caution) Quality: * * * * Acceptability: -2 – 2017: NO GREATER LOVE is a Christian, patriotic documentary about American soldiers in Afghanistan, which focuses on the “No Slack” battalion of the US Army 101st Airborne Division. Told through the eyes of the battalion’s Christian chaplain, it includes what happened to them after coming home. Footage shot by U.S. Army Chaplain Justin Roberts, including lots of actual battle footage, is interspersed with commentary and interviews with the soldiers. The soldiers discuss how events in Afghanistan affected them, and the physical, mental and emotional issues they and their brothers in arms faced in coming home. NO GREATER LOVE is one of the most powerful, best documentaries ever made. It’s thoroughly captivating. The footage from the battlefield is intense. And, the interviews with the soldiers are incredibly informative. They are also often stirring and heartbreaking, especially when the soldiers talk about losing one or more of their own brothers in arms and when talking about the struggles they face returning to civilian life. NO GREATER LOVE contains many heartbreaking moments. However, it also has great moments of victory. Not the least of these victories is the way in which the surviving soldiers come together to help one another, demonstrating real Christian love. There are six “f” words and a GD profanity in NO GREATER LOVE. So, strong or extreme caution is advised. However, NO GREATER LOVE has overt references to God, church, prayer, and the Scripture passage in John 15:13 on which the movie’s title and its premise are based. 4. AMERICAN SNIPER: (Extreme Caution) Quality: * * * * Acceptability: -2 – 2014: AMERICAN SNIPER tells the story of Chris Kyle, the most successful sniper in U.S. military history. Chris grew up to become an expert marksman and a rough rodeo cowboy with strong Christian faith. After marrying his wife, a crisis happens in the Middle East, and Chris joins the Navy Seals. An expert marksman, he becomes a legend, shooting men, women and children who are trying to kill the Americans and their local allies. Meanwhile, Chris’s wife has two children at home, but each trip home after a tour of duty, he becomes more alienated. Eventually, Chris is ready to return home, but he’s not the same man. Based on a true story, AMERICAN SNIPER is full of strong Christian faith, self-sacrifice, and patriotism. The movie is endlessly captivating and full of jeopardy, and Clint Eastwood does a magnificent job directing. That said, after countless killings, the audience may become war weary. Also, characters lose faith and courage. Finally, AMERICAN SNIPER contains many “f” words, extreme violence and brief lewd content. So, extreme caution is required. Editor’s Note: As noted above, some of the recent movies above contain strong subject matter, so caution or even extreme caution is warranted, even for older teenagers and adults. 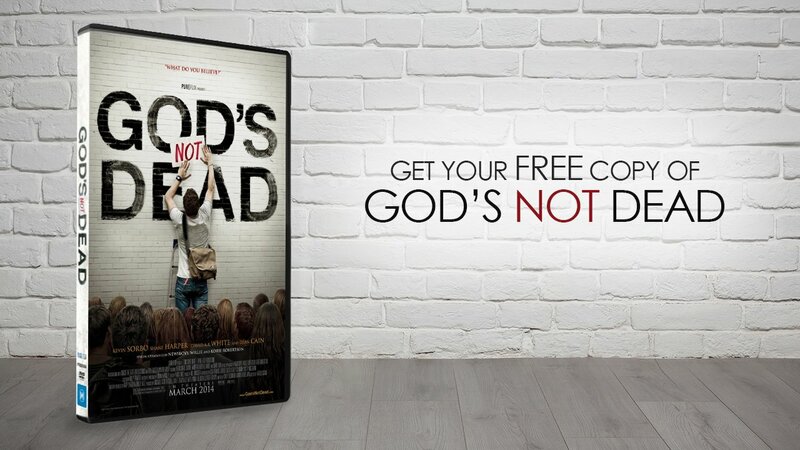 God’s Not Dead in Hollywood!